A comprehensive Zealot guide that I wrote for Warhammer Vault is currently up on their site and now part of the side bar menu. Damn not to shabby. I went over a lot of the basic mechanics and left out a lot of names for the attacks. What can I say, I am bad with names. There is a shout out to GreySoul at the bottom, of course. As our PR machine slowly takes off…. which was the only requirement I made for writing said article in question. =D So go on over, check it out, let me know what you think. Yup. Mark Jacobs just lifted the NDA. I am currently hanging out over at Warhammer Vault answering all the questions I currently can. This also means my article about the Zealot should be releasing soon as well. So the plan goes as follows. Come opening day of Warhammer online, I am going to be over at Balcloth’s place. Money has been set aside for frozen pizza and I have the time off scheduled from work. Only one piece of the puzzle remained, the computer. Sure I could bring my “cube of death” over to Balc’s place, but I would have to bring the 24inch monitor, keyboards, etc etc. And the laptop I have is pretty awesome. Many of nights were spent playing World of Warcraft on it. However when I tried to run the WAR beta on my little HPzd8000… it ate it. I couldn’t even get animations for running the poor thing was bogged down so bad. Now in it’s defense the little guy was top of the line for his day. 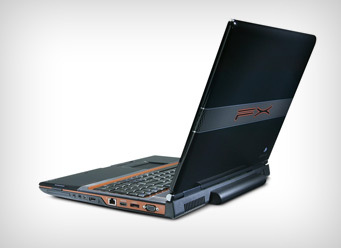 ATI radeon mobility x300 …. 256mb dedicated graphic. 2.4ghz. The list goes on, plus it was a media center laptop so I had all the fixin’s and was one of the only kids on the block who had a remote control for his computer. But yesterday, I stopped by Best Buy on a whim, and sure enough they had the laptop I had been eying. The Gateway P-7811FX. Aside from the amazing 4gb of DDR3 1066mhz ram, or the 7200rpm hard drive, the thing sports a NVIDIA GeForce 9800M GTS graphics with 512MB of sheer goodness. Did I mention the whole thing was $1445. Scary huh? I might also try this “Crysis” I had been hearing so much about. Anyway, I am ready for WAAAAGH. This machine spits out warhammer without a problem. So if any of you are in the market for a new laptop, consider this one. I finally got the SMF gallery installed for our site today. Now images of sweet pwns can be viewed by all. Once that nda is lifted expect a flurry of screenshots of my zealot. Until then and enjoy. If anyone wants to start a D2 or DAOC folder to upload some old time photos then feel free. The permissions should allow you to do so. Otherwise I’ll jump on my admin account and make that happen. PS. It might not be visible from the homepage until later on tonight. I need to edit the flash and it’s only on my home CPU. Well grab your axes and get your disc polished. Mythic has announced that WAR will be rolling out on September 18th. Of course those that pre-ordered will be getting in a little earlier a-la the headstart program. I can’t wait. In the meantime I am heading home this weekend and will dust off my old WAR3 disks and hopefully have a go with it before it’s time to focus on Waaaghammer. Hey. If anyone has been looking around the site within the last week you’d see that I have been slowly finishing off my checklist for the site. I cleaned up our blog look; finalized it so people can make comments, finished up a wicked new login system, and best of all tied all of these systems together. Only thing that is truly broken would be the forum preview to the right on this post. So you log into one, you log into them all. Other than that I am just trying to get what “content” we have down on the page so we look like a legit guild. =P I talked with Balcloth who is currently owning up in War3, going to join him soon so we can put a solid 3 man together with Bela. Warhammer online beta is going on, and Diablo 3 news is scarce. But considering it’s Blizzard, this is totally nothing new. In preperation for all of this gaming coming down the pipeline, I picked up 4gb of ram from newegg at the low low price of $90 bucks. Not bad to say the least, my system is screaming at 6gb right now at dual channel 1066mhz, but since I have WindowsXP 32-bit, 3gb is going to total waste. So it’s time to upgrade that OS (If I happen to disappear for a few days, it’s because the process didn’t go smoothly). Work is pretty brutal right now. Got a few campaigns in the works so I’ll try and be as active as I can this week. EDIT: I guess Mythic is working on some kind of surprise reguarding… well I guess Warhammer. Some say it might be DAOC related. I think it might just more of what we are expecting…. open NDA open beta… etc…. sooner or later this stuff needs to come out anyway. Well sorta. It’s been a long time running, but another large step has been made into giving us a permanent home here on the interwebz. So let’s consider this “greysoul beta 1.” As of right now virtually nothing works but the stage has been set for me to come on in and make tweaks here and there as I see fit. I had been working on this site on a system called vertrigo as a virtual run time environment, but it just got to the point where it would be easier to work on it as a live website. So in the meantime, sit back, relax, check back regularly and make sure you visit our forums and say hi. Later.